The green tea possesses the secret of longevity, since its ingredients inhibit the ageing processes of our bodies. In order to appreciate green tea first it would be necessary to learn its preparation secrets. Water that is used for infusion should be left to cool after boiling for about 5 minutes. If tea is to release its energizing properties it should be allowed to brew from 2 to 3 minutes, if it is meant to reveal the relaxing properties it should be allowed 5 to 8 minutes. Next infusion should be strained into different pot to prevent the development of bitterness. Its recommended to use the same batch of leaves for infusion about two to three times. Every time we will receive a different taste. The blackberry leaf has a styptic effect on the digestive system as well as it has anti-diarrhea, anti-inflammatory, anti-bacterial, clearing (especially intestines) properties that also regulate the digestive functions. It is also a mild diuretic and regulates the metabolic and cleansing functions of the body. It allows for removal (with the urine) of any toxins left over after the metabolic processes. Blackcurrant leaf increases the amount of excreted urine and end products of metabolism, especially of uric acid. It strengthens the stomach and heart function, cleanses the intestines, acts sudorific and antiphlogistic, antibacterial and astringent. It is used to treat urinary tract, urine retention, urolithiasis, urocystitis, rheumatism, viral gastroenteritis, the diarrhea, the putrefaction in intestines, large intestine ulceration, stomach neurosis, the migraine and atherosclerosis. External decoctions of the leaves are used for rinsing the mouth and throat. 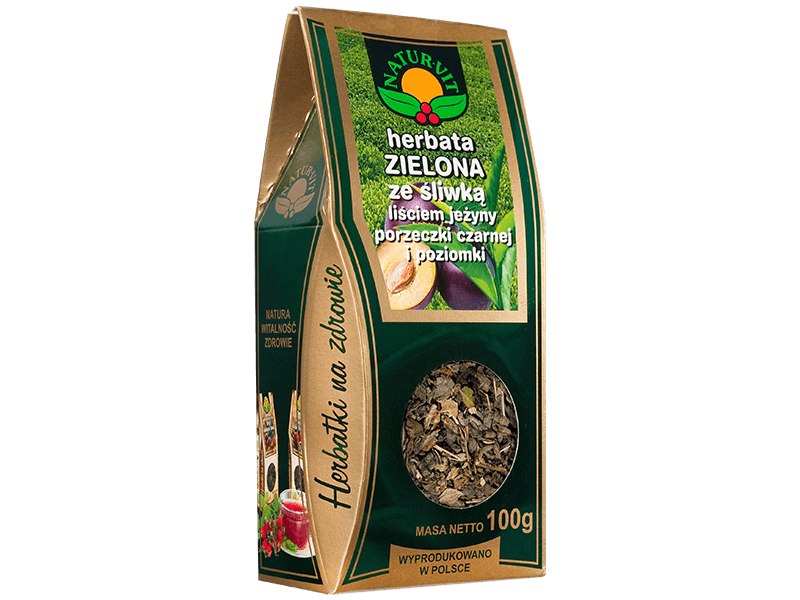 Wild strawberry leaf possesses purifying and diuretic properties. It removes all harmful products left over after the metabolism processes and it also cleans liver, aids wound healing, has anti-bacterial, anti-diarrhea and astringent properties. It is used is gastric infections, in cases of inflammation of the digestive system and appendix, and also in cases of hepatitis, in profuse menstrual bleeding, in rheumatism, anemia, arthritis and uratic diathesis. Plum fruit contains a lot of pectins, organic acids, flavonoids, A, E, C and B vitamins, magnesium, iron, phosphorus and calcium. It shows the digestive action,, regulates fermentation in the large bowel and defecation. It regenerates the mucous membranes in the digestive and respiratory systems. It’s anti asthmatic and above all rich in vitamins. © 2016 Natura Wita - All rights reserved.